Find the best priced trip! Baska Voda (1,600 inhabitants) is located about 9.5 km northwest of Makarska. The place was founded in ancient times. On a plateau called Gradina, there are traces of habitation and late antique Byzantine fortification, Biston. The late baroque church of St. Lawrence was most probably the ancient site. Name of Baska Voda was first mentioned in 18th century, when after the expulsion of the Turks, residents of the hamlet called Bast settled in this area. 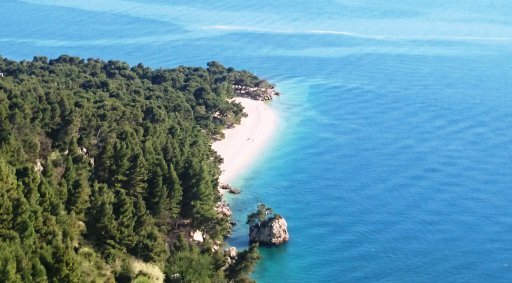 Baska Voda was a fishing and trading place, and today is a modern tourist center that offers a clean sea, beautiful beaches with pine trees and a variety of entertainment. Besides sea, sun bathing and pleasant walks, museums and historical monuments, Baska Voda also offers cultural and entertainment events. Very interesting are religious events, especially the procession Velika Gospa (Virgin Mary), which passes through all the villages in the municipality (15 km). In addition to various sports and recreational facilities big attractions are walks trough mountain villages, particularly Bast and Topici, famous for its cheese, prosciutto and bread.